One reason locally-produced wines seem to appeal greatly to “the locals”, no matter where “local” is, is that the winemakers and customers grow up together in significant number to create a strong market for those wines with the characters that match the local lifestyle, foods, culture, and palate. Our wine club features an array of our own Northwest version of local wines. When we move away from the local flare, we experience life from another area and with flavors and characters that represent other lands. Today, we have selected a great wine to represent the Chianti Classico region of Tuscany, Italy! The beautiful label brought us to the table, with the hopes that the wine inside would impress. Let’s face it, it’s commonplace to judge a wine by its label whether right or wrong. When we can avoid the matter altogether by finding a great wine with a great label, it’s a win-wine situation. So it was with a sigh of relief that I discovered a well manufactured example of Chianti with sweeping, complex earth and berry fruit flavors. The drying tannins ease throughout as fruit flavors flow effortlessly. This is a delicious wine to pair with traditional Italian fare. 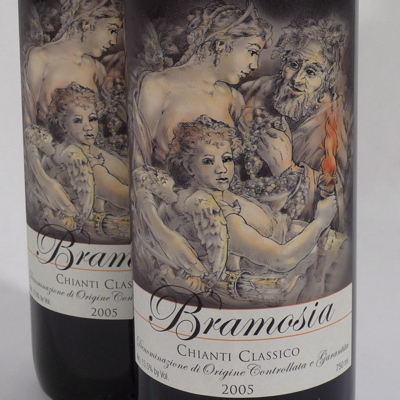 Meaning “desire” in Italian, the name “Bramosia” was chosen as a moniker to represent the romance of wine. The importer talks about the winery: “Donna Laura specializes in producing wines from first-class Sangiovese grapes grown in the Castelnuovo Berardenga region of Chianti Classico. This new venture, spearheaded by owner Lia Tolaini-Banville, seeks to fulfill a need in the American market for high quality Sangiovese wines at an accessible price point that are both representative of the terroir of the region, as well as international in style. To combine the best of tradition and modern characteristics, two Sangiovese clones are grown in the Donna Laura vineyards. CH-20 brings structure, while F9, a more modern clone, augments the fruit intensity of the finished wine. One of the first areas to classify its borders and become delimited in 1716, Chianti Classico is fixed in minds worldwide as the proto-typical, idyllic Italian wine region. This wine is regularly sold for $18.99, but is available to wine club members for only $15.99! Visit and browse Italianmade.com for encyclopedic information about regional wines AND foods of Italy. The Sangiovese grape of Chianti is making a name for itself in the Northwest as explained in this Wine Press NW article.